Located less than 15 miles from Washington, D.C., Gaithersburg is a major international hub for cyber and technology. However, residents still enjoy the charm of a small town. A community that never stops, it’s a pedestrian-centric location with modern housing and weekday passenger rail service to Washington, D.C.’s Union Station. Its popular Olde Towne District also includes shops, restaurants, and a variety of small businesses. 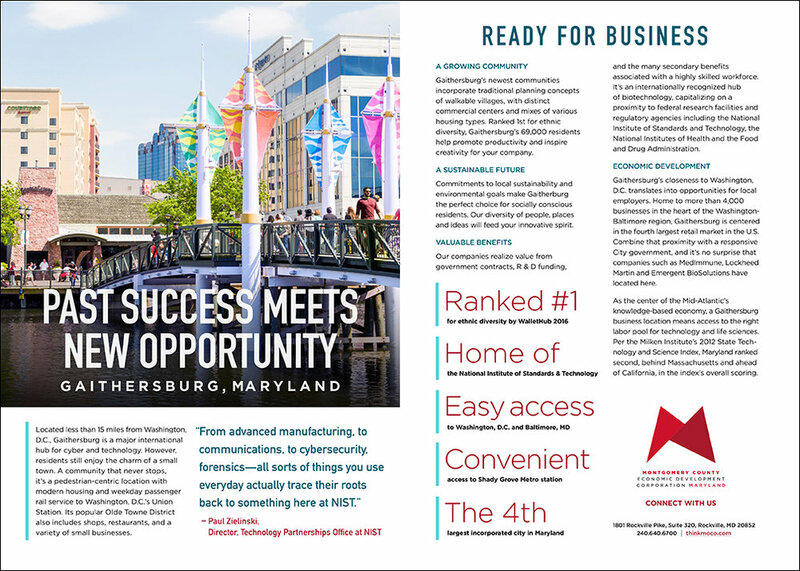 Gaithersburg is a major international hub for cyber and technology, including the federal government’s National Institute of Standards & Technology. Gaithersburg’s newest communities incorporate traditional planning concepts of walkable villages, with distinct commercial centers and mixes of various housing types. Ranked 1st for ethnic diversity by WalletHub 2016, Gaithersburg’s 69,000 residents will help promote productivity and inspire creativity for your company. Commitments to local sustainability and environmental goals make Gaithersburg the perfect choice for socially conscious residents. Our diversity of people, places and ideas will feed your innovative spirit. Our companies realize value from government contracts, R & D funding, and the many secondary benefits associated with a highly skilled workforce. It’s an internationally recognized hub of biotechnology, capitalizing on its proximity to federal research facilities and regulatory agencies including the National Institute of Standards and Technology, the National Institutes of Health and the Food and Drug Administration. We will continue to actively pursue additional acquisition opportunities that leverage our core competencies and drive growth. Gaithersburg’s closeness to Washington, D.C. translates into opportunities for local employers. Home to more than 4,000 businesses in the heart of the Washington-Baltimore region, Gaithersburg is centered in the fourth largest retail market in the U.S. Combine that proximity with a responsive City government, and it’s no surprise that companies such as MedImmune, Lockheed Martin and Emergent BioSolutions have located here. As the center of the Mid-Atlantic’s knowledge-based economy, a Gaithersburg business location means access to the right labor pool for technology and life sciences. Per the Milken Institute’s 2012 State Technology and Science Index, Maryland ranked second, behind Massachusetts and ahead of California, in the index’s overall scoring. Through our partnership with LoopNet, you can search listings to find the best possible space for your Gaithersburg business. Simply replace Montgomery County, MD with Gaithersburg in the search bar and hit the magnifying glass icon. You can also check out the Maryland Department of Commerce's Incubator tool or look for shared offices. Explore these options and let us help you select the right one for you. The NATIONAL INSTITUTE OF STANDARDS AND TECHNOLOGY promotes U.S. innovation and industrial competitiveness by advancing measurement science, standards, and technology in ways that enhance economic security and improve our quality of life. From its growing technology hub to robust retail sector, Gaithersburg is a fantastic choice for any business.